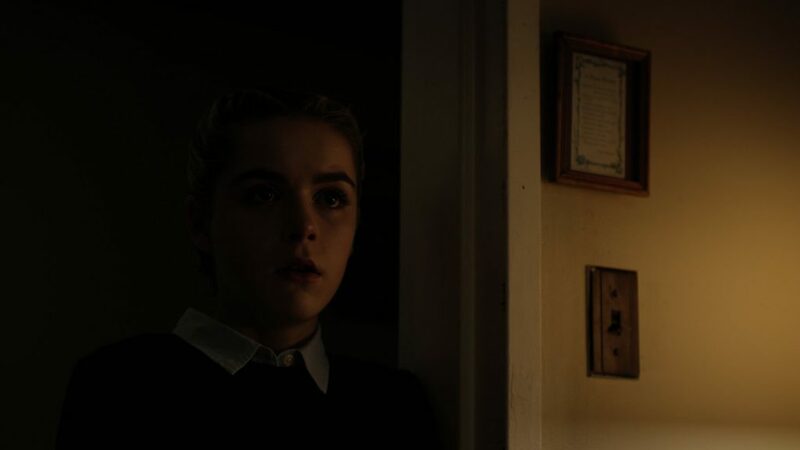 The Blackcoat’s Daughter (also known as February) is the debut from Oz Perkins. A stunning style but unfortunately not a pace for my liking. I honestly do love a slow-burner, but The Blackcoat’s Daughter is a tad too slow for me. 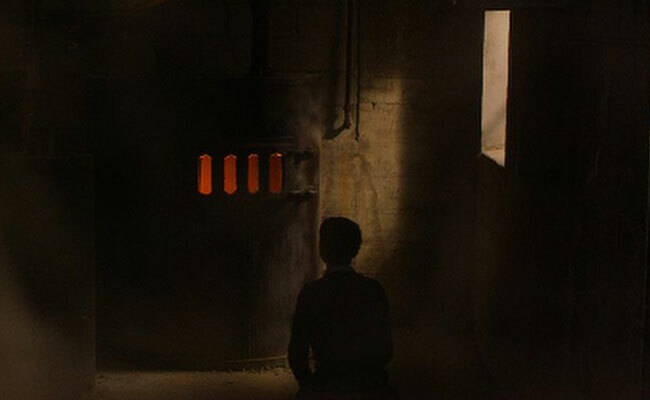 I certainly do love Korean horror and thriller movies, which absolutely tend to build up slowly. In Korean movies, the slow pace is often used to give you in-depth character portraits, which make sense to me. In the case of The Blackcoat’s Daughter it’s more of a stylistic choice, it seems. Also, maybe I just wasn’t in the mind-set for this kind of movie. But really, when the movie is described as a “chilling and suspenseful horror film”, then I’m expecting to be on the edge of my seat. Instead, I was very much leaned back and waiting for things to get started. In this case, I didn’t enjoy the long wait when it’s close to an hour of build-up. For me, I’m constantly trying to guess how things fit together, and with a story evolving this slowly, I’ve already guessed pretty much everything. The result for me is that I’m just waiting for you to tell me the story when I’ve already figured out. Okay, I’m being too hard on the movie now, because I did actually like many elements as well. The Blackcoat’s Daughter does have a very creepy tone that never leaves you. Not even for a second. And I do find that impressive. The problem is simply that, to me, this could’ve been an amazing short film instead. You have to give Oz Perkins credit for his sense of style. I mean that honestly! He obviously has a vision of how this should play out, and I commend someone having a very clear style. The problem with this is that many people won’t like it. It goes too far from being mainstream and yet doesn’t fit any genre. Again, I usually like this, but you can go too far and suddenly your audience is simply too small. So much time is spent dwelling on singular images and emotions. The story, though, is kept in the background for too long. When the story does get to move forward, it works so much better. There’s still a slow pace and a lot of dwelling, but I’m fine with that as long as the story is at the heart of everything. Otherwise, don’t label the movie as a “chilling and suspenseful horror film”. It’s all about managing expectations. That’s why I’ve already stated that maybe the problem it with me. I wasn’t ready for this kind of movie. And I’ll gladly admit that if I had watched this movie, knowing what kind of movie it really is, then I would’ve liked it a lot more. I love drama, and indie and weird and different. I’m not sure why Oz Perkins is so intent on labeling his work “horror” when it’s more of a drama or thriller. And yes, with elements of horror. I mean, I guess I do know. When you’re the son of Mr. Psycho himself (Anthony Perkins, who played Norman Bates in Hitchcock’s Psycho), then people expect it. Also, producers will bet their money on a horror project from someone adjacent to a horror legend. I get it. But horror fans at large probably won’t be thrilled with this. What everyone should love, however, is the acting in The Blackcoat’s Daughter. Especially the young Kiernan Shipka (Mad Men, Carriers) is very creepy in the best way! She’s the primary lead along with a very good Emma Robert (American Horror Story), who I’m not always crazy about. Also, in this movie, she doesn’t get as much to work with as Shipka, but both a very memorable. For Kiernan Shipka, she gets to portray a character that falls apart in front of us. Her entire being changes with each scene and her performance is award worthy. The same goes for Lucy Boynton, who plays across from Shipka in many scenes. They are perfect opposites, and the movies liven up whenever they’re in a scene together. Also, we have James Remar (Dexter), who is incredibly intense and just wonderful – as always. Across from him, we have Lauren Holly, who continues to be almost unrecognizable. But she is acting her heart out in The Blackcoat’s Daughter and, again, I was never bored when scenes featured either of these two. Like I’ve already stated in multiple ways, there’s a very clear sense of style that I appreciate because it works as a defining element. There are also horror moments that are absolutely brilliant. As a whole, however, this is much more drama than it is horror. If you watch it as such, I believe you’ll get a much better experience than I did. 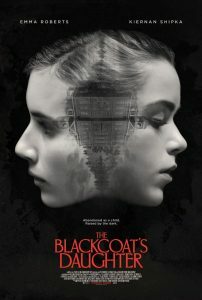 The Blackcoat’s Daughter is still playing at film festivals – we watched it at CPH PIX. It has also been released in a few countries, and according to IMDb, it will be released in the US in 2017. Two terrified girls must battle a mysterious evil force when they get left behind at their boarding school over winter break.